Velvet Blazers portrays a luxurious look as velvet is closely related to wealth and it possesses a shinny gloss appearance which draws everyone’s attention. These kinds of jackets are available in various shades of all colors with various patterns and trendy designs making it suitable for all kinds of occasions. They are apt for a chilly and cool weather making the wearer to feel warm and comfortable. One need not worry about the size as it comes with proper shoulder pads and the lapels come in minimal thickness which gives a soft and tender look. 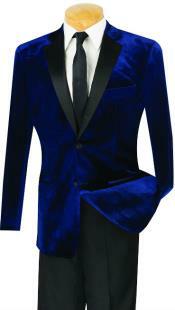 A velvet blazer changes the look and personality of a person to look like a perfect gentleman. Usually velvet jackets come in single button closure with besom pockets to make it look elegant and attractive and double vent is provided for proper air circulation. For a better longevity of this blazer, one must put it for dry clean only and there are lots of varieties in color like navy blue, deep purple, bottle green and much more. When these jackets are paired with appropriate accessories, it gives an elegant, gleaming and professional look without a doubt.